A photo taken from the 2016 FEASTIVAL. Audi FEASTIVAL, an annual culinary and live arts party that benefits FringeArts, has announced it's changing things up for 2018 with a new concept, thought up by co-hosts Michael Solomonov and Nick Elmi. 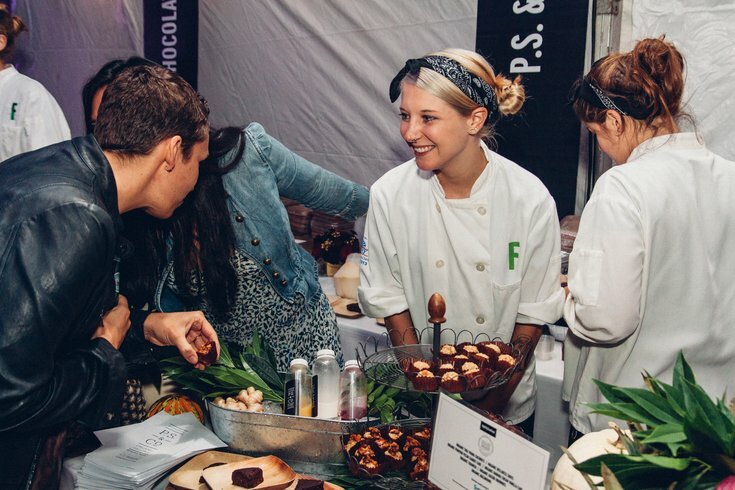 At this year's FEASTIVAL, 60 of the city's top chefs will collaborate in pairs to create exclusive, one-night-only dishes representative of one of five Philadelphia neighborhoods: West Philly, South Philly, Chinatown, Kensingon/Fishtown or Northeast Philly. Chefs will be challenged to cook outside of their comfort zones and create dishes that are truly collaborative. Teammates and neighborhoods will be assigned, with FEASTIVAL organizers aiming to pair chefs who haven't collaborated before for the event. "For the ninth year, my co-host, Nick Elmi, and I wanted to push the creative envelope ... and to use this as an opportunity to give guests an experience they won’t find anywhere else in Philly," Solomonov stated. The 2018 Audi FEASTIVAL will take place Thursday, Sept. 27. Tickets are now available, as of July 9.